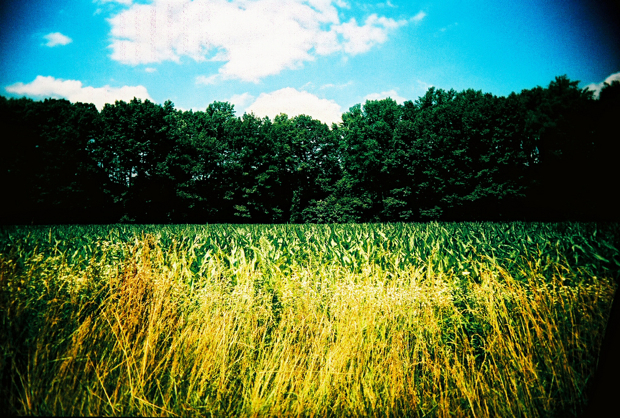 How biofuels and speculation are driving food prices to scary new heights. Why have global food prices spiked not once, but twice in the last three years, raising the specter of famine and triggering worldwide food riots–including the Arab Spring? Many explanations have been floated, including climate change-related droughts in Australia, volatile oil prices, “food security” export restrictions, and last but not least, feeding China’s strategic pork reserve. But according to a scientific paper released this morning by the New England Complex Systems Institute, there are only two factors that matter: ethanol and financial speculation. The former is easier to prove. A drop in the bucket only a decade ago, ethanol will consume a remarkable 40% of the U.S. corn crop this year, comprising 16% of world corn production and 4% percent of total grain production overall. 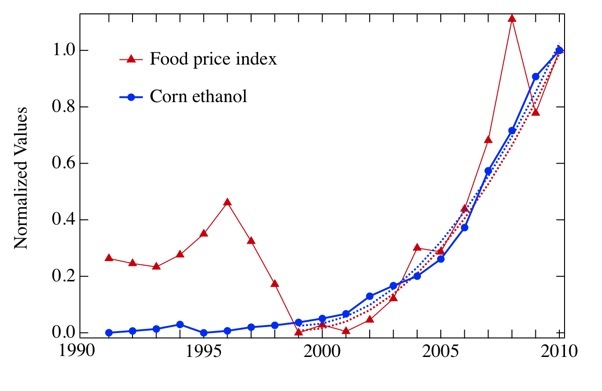 The paper’s authors mapped the rise of ethanol production to the steady climb of the United Nations Food and Agriculture Organization’s Food Price Index since 2004 and found a close fit, much closer than Australia’s droughts (too small), oil price spikes (too late), or China’s craving for pork bellies (big, but not big enough). “Ethanol is much bigger. It’s bigger by a factor of 20,” says Yaneer Bar-Yam, one of the paper’s authors and the president of NECSI. The paper’s second claim is more controversial. While ethanol is responsible for the long-term increase in baseline prices, it can’t explain the bubble-and-bust dynamics of 2007/2008 and 2010/2011. So NECSI’s researchers set out to build an all-purpose mathematical model of speculative bubbles, feeding it price data to see if there was another close fit. What they found refutes the OECD’s findings and confirms the suspicions of Harpers’ Frederick Kaufman –the repeal of the Commodity Exchange Act of 1936 and the deregulation of commodity futures in 2000 transformed the futures markets from an instrument of liquidity to a place to park one’s money. Instead of being a place where farmers and agricultural businesses set reasonable prices, the markets have become just another place for speculation. All of that money–commodity index holdings soared from $13 billion in 2003 to $317 billion in 2008–inevitably caused distortions in the market. “If you look at our figures, you’ll see there’s a huge difference between the futures price or the spot price and what should be the equilibrium one,” Bar-Yam says. The authors’ recommendations are straightforward and immediate–to drive down prices for the world’s poor, governments must restore financial regulations (including the Commodity Exchange Act) and begin winding down ethanol production. “There is a moral imperative here,” says Bar-Yam. “And from an economic standpoint, efficient allocation and optimality are desirable things,” neither of which are currently being served. And if they don’t, as the authors noted last month in a related paper, the turmoil of Arab Spring may go global.